DISTINGUISHED and faithful service or exceptional gallantry and courage have from time immemorial been recognized by the award of various Orders, decorations and medals. For many years they were chiefly awarded for chivalry in action, but since Queen Victoria’s reign the qualifications for awards have been greatly extended and include long and faithful service in all walks of life. 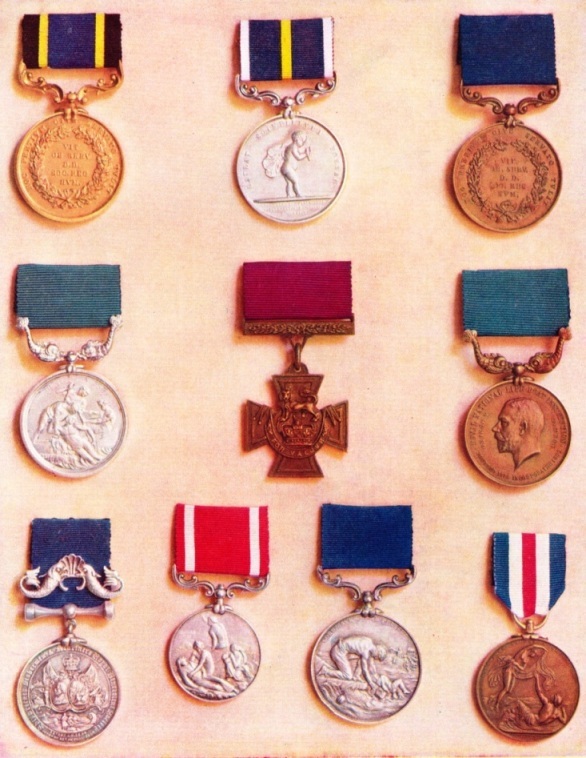 In the sphere of medals, Queen Victoria’s name will be especially connected with her introduction of the Victoria Cross (see colour plate) and the Albert Medal. Most people are acquainted with the Victoria Cross and the letters VC, and it is unfortunate that the Albert Medal, the holders of which are entitled to the letters AM after their names, is not better known. The Albert Medal corresponds to the VC, the only difference being that the VC is awarded for bravery in the presence of the enemy, whereas the Albert Medal is awarded in peace or war alike. The standard of personal heroism required to earn this medal is of the highest possible order, for it requires that the recipient would have been most unlikely himself to have survived the action which won this distinction. A man must look death in the face before he can earn the Albert Medal. It is only natural, therefore, that many who win it die in the attempt. In such instances His Majesty makes a posthumous award and presents the medal to the next of kin. The Albert Medal was introduced by Royal Warrant in the year 1866. It was originally restricted to deeds of bravery performed amid the perils of the sea, but in 1877 another Royal Warrant extended its award to deeds of great self-sacrifice performed on shore, such as when fires or other disasters occur in coalmines. Until 1917 the Albert Medal was graded into First and Second Class. This led to such difficulty in determining under which class a deed should rank that there is now only one Albert Medal, though in extreme - one might say superhuman - instances of bravery the medal is awarded in gold. A holder of the medal who performs a second act of gallantry which would have earned the medal is entitled to a bar. There appears to be no instance on record of a bar ever having been awarded - proof in itself of the difficulty of earning this high honour. The ribbon of the Albert Medal is blue and white when awarded for heroic acts performed by mariners and others who endanger their own lives in saving or endeavouring to save the lives of others from shipwrecks and other perils of the sea. The ribbon is red and white striped for similar heroism on land. The medal itself is an oval badge with a centre monogram of the letters V and A interlaced with an anchor. Round the badge is inscribed “For Gallantry in Saving Life at Sea”, or “On Land”. The Albert Medal is made of bronze, except in the rare instances when it is awarded in gold. Recommendations for the award of the Albert Medal are made to the Sovereign by the First Lord of the Admiralty, the President of the Board of Trade or the Home Secretary, according to whether the deed was performed by persons in the Naval Forces, the Mercantile Marine or on land. The medals themselves are invariably presented to the recipients by the Sovereign in person. By the Merchant Shipping Act of 1854, the Board of Trade was given authority to award medals for acts of gallantry performed at sea. The medals, in silver and bronze, were not of a size that could be worn, and were therefore more in the nature of mementoes. The rules appertaining to the award of these medals were changed in 1903, and from that time up to the present day they can only be awarded by the Sovereign, who, as with the Albert Medal, personally decorates the recipient. The medals are now made in such a size as can be worn. These medals are awarded to any persons, whether British subjects or foreigners serving in British ships, who render service and give help in rescuing life at great personal risk, though the standard required differs from that of the Albert Medal. The service must be rendered on the high seas or round the coasts of the British Empire. Here, again, the fact that the number of medals awarded, about 500 in all, is small and that only two bars to medals have been issued is a testimony to the high standard of gallantry required. THE VICTORIA CROSS, which, with its blood-red ribbon, is probably the best known of all decorations, is shown in the centre of the colour plate opposite. Reading from left to right, the first medal shown is the Stanhope Gold Medal, which was instituted in memory of Captain C. S. S. Stanhope, RN, who died in 1871 The medal is awarded by the Royal Humane Society for the bravest life-saving deed of the year. The silver and bronze medals of the Royal Humane Society are awarded for saving or attempting to save life from drowning. Medals of the Royal National Lifeboat Institution are shown on either side of the Victoria Cross. Gold, silver and bronze medals are awarded by the RNLI, and in every instance the ribbons are light blue. The obverse shows the head of the reigning sovereign, with the inscription of the Institution. The reverse shows a life-saving tableau. The bottom row shows on the left the silver medal of the Shipwrecked Fishermen and Mariners’ Royal Benevolent Society. The ribbon is dark blue, with a buckle consisting of two dolphins. An elaborate design incorporates two ovals representing a bust of Nelson, and a ship. The Board of Trade Silver Medal is shown next, with a silver medal awarded by the Liverpool Shipwreck and Humane Society and a bronze medal awarded by Lloyd’s. The ribbon of these medals (see colour plate) is red with white stripes near either end, and the medals have the head of the Sovereign and the Royal Cypher with the inscription “Awarded by the Board of Trade for gallantry in saving life’’ on one side. The other side shows the figure of a man holding on to a spar in the sea, a man supporting a seaman and a woman and child seated on a rock. In addition to these Board of Trade medals, which can be awarded only to persons serving in British ships, there are special medals which can be awarded to foreign subjects for saving the lives of British subjects, for gallantry and humanity, or for assisting British vessels in distress. These medals are of gold or silver, but except where personal risk of life has been taken it is more common now to present plate or money awards for “services rendered”. In 1896, when the steamship Drummond Castle was wrecked off Ushant, France, with the loss of all on board except three, Queen Victoria issued a special “Commemorative Medal” as a “token of gratitude from Queen Victoria”. These medals were given to about 250 of the inhabitants of the islands in the vicinity of Ushant who endeavoured to save life, or who, by their kind-hearted endeavours in recovering and attending to the bodies of the drowned, gained the sympathy and thanks of the British nation. The Royal Humane Society, which was founded in 1774, awards the Stanhope Gold Medal and silver and bronze Medals for life-saving (see colour plate). The Stanhope Gold Medal, which was instituted in memory of Captain C. S. S. Stanhope, RN, who died in 1871, is awarded for the bravest life-saving deed of the year. The ribbon is dark blue with yellow and brown edges. The Royal Humane Society silver and bronze medals are awarded for saving or attempting to save life from drowning. Whether a silver or bronze medal is given is decided by the Society’s Committee according to the circumstances of each event. The reverse of the medal bears a civic wreath, the Roman award for saving life, and the Latin inscription means - “He has obtained this reward for saving the life of a citizen.” In instances where life has not been saved the inscription is slightly altered. In the event of a person rendering similar service a second or third time, bars are added to the medal. In addition to the award of medals, the Society also gives testimonials in vellum or parchment, or sometimes money when the service performed does not come up to the standard required for a medal. The Committee deals with 500 or 600 awards a year. The awarding of these medals is in the hands of the Committee of Management, and awards are made for great courage and leadership in face of grave danger. It often happens that where the coxswain of a boat has earned a Gold Medal, the members of the crew may be awarded the Bronze Medal for having participated in the gallant deed to a lesser degree. As with other medals, there is virtually no limit to the number of times a man can earn them, and an outstanding example of this is Henry C. Blogg, the Coxswain of the Cromer (Norfolk) lifeboat. In 1917 Blogg won his first Gold Medal when rendering service in a terrific gale to a vessel which had been mined. A clasp followed in 1927 when he displayed great gallantry in saving life from the steamship Georgia. Five years later Blogg again distinguished himself and was awarded the Silver Medal and a bar the following year. Another outstanding figure is Grace Darling, who won the Gold Medal from the RHS and the RNLI Silver Medal in 1838. Few people are aware that Lloyd’s awards medals as an honorary acknowledgment to those who have by extraordinary exertions contributed to the saving of life at sea. The ribbon of this medal is red, white and blue; red in the centre with white and blue either side (see colour plate). On one occasion, and one only, the Corporation of Lloyd’s decided that an act of gallantry in saving life had been performed of such an exceptional and dangerous character that they determined to strike a gold medal. The recipient was Admiral Sir E. R. G. R. Evans, KCB, DSO, who with daring courage assisted in saving life when the steamship Honq Moh was wrecked on the China Coast. In 1893 Lloyd’s added to their list of medals one for meritorious services to be awarded when “extraordinary exertions have contributed to the preservation of vessels and cargoes from perils of all kinds.” The medal is struck in silver and bronze, one side having the shield of the Corporation with a spray of the rose, shamrock and thistle underneath and “Presented by Lloyd’s” round the top. On the other side is a wreath of oak leaves with the inscription “For Meritorious Services” on a scroll. The ribbon of the medal is blue with wide silver bars near the ends. Other medals are awarded by Lloyd’s for more general services to the Corporation. The Liverpool Shipwreck and Humane Society also awards medals in gold, silver (see colour plate) and bronze for saving life at sea. The ribbon is dark blue, and on one side of the medal is an engraving descriptive of saving life at sea with an inscription “Lord, save us, we perish.” On the reverse side is a wreath of oak leaves encircling a pelican, and the Society’s name with the date 1839 is shown round the edge. Gold and silver medals for “heroic and praiseworthy exertions to save life from shipwreck” are awarded by the Shipwrecked Fishermen and Mariners’ Royal Benevolent Society. They also give what is known as the “Emile Robin” award, which is money derived from a Trust Fund, and given annually to the Master and Chief Officer of the British ship which is adjudged by the Committee to have effected the most meritorious rescue during each year. In 1934 this was awarded to the Master and Chief Officer of the steamship Ascania. Silver medals were given to members of her crew who took part in the rescue of the survivors of the steamship Usworth in mid-Atlantic. The ribbon of the medals (see colour plate) is dark blue and attached to it is a buckle. From two dolphins and a silver clasp hangs the medal, which has on one side a rather elaborate engraving consisting of two ovals, one containing a bust of Nelson and the other a ship. A crown and laurels surmount these ovals and the Union Jack and the Society’s Flag project from the sides. The ovals are set on a background which depicts seafaring objects, and below is a shipwreck scene encircled by the Society’s nomenclature.